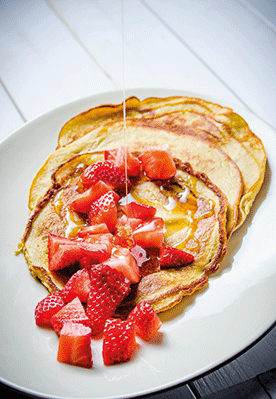 A gluten and sugar-free alternative for Shrove Tuesday! 1. Split the vanilla pod in half lengthwise and then scrape the inside with the tip of a knife to extract the seeds. Combine the plantain, eggs, milk, cinnamon and vanilla seeds and blend to obtain a creamy batter. 2. Cook the pancakes in a hot frying pan with a teaspoon of coconut oil over a low heat. 3. Once the pancakes are cooked, using the same frying pan add a tablespoon of coconut oil. Stir fry the strawberries and add the honey. Simmer for 1 minute and remove from the heat. 4. To serve, place the pancakes on a plate and top with the strawberries and honey sauce. Mick Élysée is an international TV chef and author of the new healthy recipe book Not Guilty.